My feet are like magnets to the wind because I'm not falling. 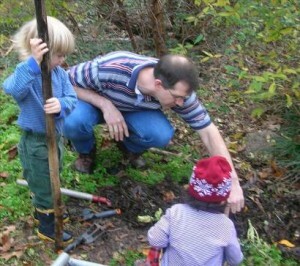 We support scientific thinking when we support children’s play. 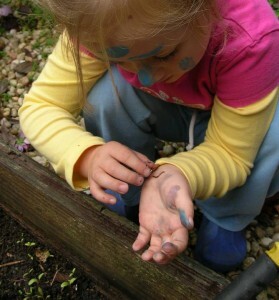 Play allows children to form, test and rework questions that are compelling and immediate for them. How far can I pull this rubber band before it snaps? How many blocks can I add before this tower will topple? What happens if I turn the paper this way, and the scissors that way and try to cut again? What will this slimy stuff do if I try to pull it apart? What happens if I sit on wax paper when I go down the big slide? We also support scientific thinking when we offer many materials that allow kids to experiment with cause and effect, like ramps and balls, or the water wall with its different connections between pumps and spigots, or the bean box full of magnets and metallic marbles. 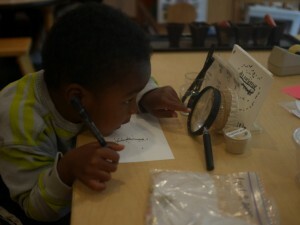 We support scientific thinking when we encourage close observation — by allowing children the kind of uninterrupted time they need to make a close study of a tiny insect; by providing magnifiers when they want to look even more closely; and by encouraging kids to draw what they are looking at. And we support scientific with the questions we ask, and, perhaps more important, those we choose not to ask. Jim Greenman tells a sad but true story about a conversation between teacher and child he overheard at a zoo. The boy, eager and inquisitive, spots the flamingos and starts to say something when his teacher interrupts, “What are those?” “Birds. But…” “Well, what color are they?” “Pink… but….” “And how many do you see?” “Well, 3, but….” And then as she pulls him toward the next exhibit, his original thought still unspoken, he launches a preemptive strike, announcing with resignation — “Giraffes. Yellow. Two.” The wonderful becomes mundane, and any urge to ask questions and investigate is lost. Do seeds come after the plant or the plant makes the seed, or the plant doesn’t make the seed? Where does the seed come from if the plant doesn’t make it? How do seeds form? A seed forms because a plant makes it. What if the plant is not made and there’s a seed. How is that seed made? There always has to be a plant to make the seed, that’s where the seed comes from. Then Eli, are you wondering where the heck the plant came from in the first place, if you have to have a seed to grow a plant? Oh, that’s a hard question. I can only tell you what I think might have happened. So I think probably a very long time ago, a plant evolved to produce seeds. There was a time when plants we probably wouldn’t recognize didn’t make seeds. This was a long time ago — like before dinosaurs, right? Really really long ago. So one day a plant changed and it started making seeds and that’s where plants that made seeds came from. What if there wasn’t those plants and there was a seed? How was that seed made? I don’t know. How do you think it might be made? The best question a teacher can ask is one for which every person has his or her own answer.